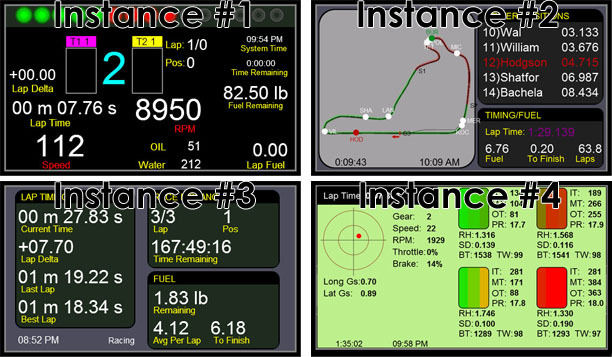 The Z1 Dashboard software can be run multiple times simultaneously. When you run the software you create what is known as an "instance." If the software is running and you attempt to run it again, you will create another instance of the software, and end up with two windows both running the software. You may create up to 6 separate instances. Watch the YouTube video on using multiple instances. By default the second instance displays the Track Map dashboard with driver positions. The third instance displays the Timing & Scoring dashboard. The fourth instance displays the Telemetry dashboard with friction circle and tyre graphics. The fifth instance displays the Adjustment dashboard. All settings are specific to each instance. You can access these settings in the Car 1 tab of the Settings Dialog. The Settings Dialog will display the settings for its specific instance. And as each instance can have different settings, you will need to open the Settings Dialog for each instance if you wish to customize that instance. Note that if you have a Z1 LCD Screen, then instance 1 is always displayed on the LCD Screen. Instances 2 through 6 would be displayed on your regular Windows monitor. Also when using the Z1 LCD Screen, the Always On Top, Hide Title Bar, Scaling and Auto Resize options have no effect on instance #1.